If you didn’t have success with your annual impatiens plantings last year it may have been due to a disease called downy mildew. We’d like to offer information on this and suggest some alternatives for you this season. Thanks to Jim Jacobi of the Alabama Cooperative Extension System for some of the pictures used here, and to Al Krismer at Al Krismer Plant Farm for helpful information concerning this disease that affects bedding plant impatiens and double impatiens. Impatiens downy mildew is a disease which affects impatiens in the landscape, developing in cool humid conditions – just what many of our evenings are like here in early spring when folks are planting. 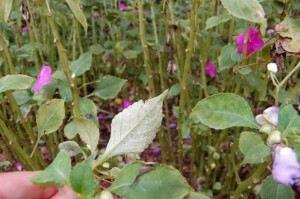 Symptoms begin with yellow spots on the leaves. It slowly progresses, until under the leaves there will be a white, almost fuzzy growth, (hence the name) leaving a weakened plant with no blooms and finally, just spindly stems. Impatiens downy mildew needs water and cool temperatures to spread. It can also occur in the more humid evenings in the summer. As of April 2013, there are no fungicides to combat this disease. Airborne spores can travel several miles, infecting distant impatiens plantings under favorable conditions. Younger plants seem most susceptible. 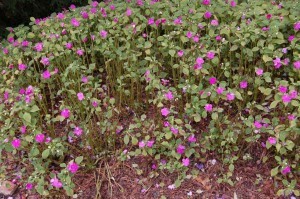 If this happened to your impatiens last year, we strongly advise not replanting impatiens in those areas. 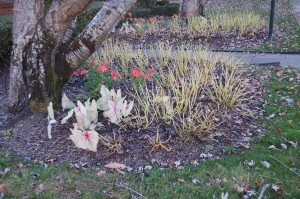 Spores from the disease can overwinter in the soil for several years, re-infesting new impatiens plantings. Best not to plant impatiens here this year. 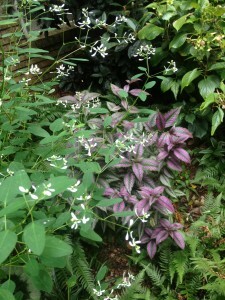 We want to assure you that there are many wonderful alternatives to impatiens – you can still have color in your shady landscape. We will offer those listed below and many more – you may even discover a new favorite! 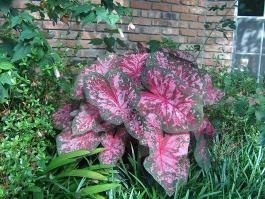 Caladiums – There are so many patterns and colors of caladiums, and they all work in shady spots either in the ground or in pots. 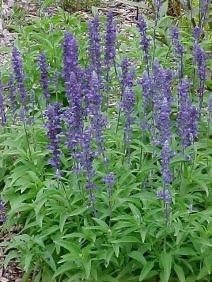 There are also varieties that will be happy in sun too. 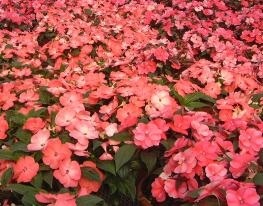 New Guinea Impatiens & Sunpatiens are immune to this disease! 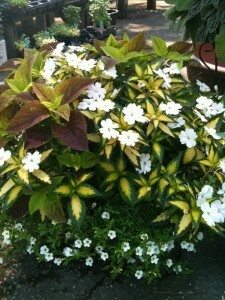 This is a variegated leaf Sunpatiens. They also have solid green leaves…. Coleus – Oh the varieties of coleus! 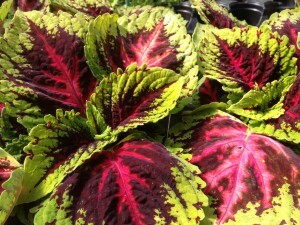 You could do an entire bed with nothing but different coleus leaves and it would be knockout! An added bonus is that most of them get as big as impatiens and every bit as colorful. Again, they will work well in planters and in the ground. Begonias – You don’t have to go with your grandma’s bedding plant wax begonias, though we’re not going to turn our nose up at them – they are beautiful when grown well. But there are others too, notably the enormous Dragonwings which are available in a red and pink. If you’d prefer white, Babywing are a bit smaller but every bit as floriferous, and do very well in shade and filtered sun. Strobilanthes/Persian Shield – you may not be familiar with this one, but you should be! 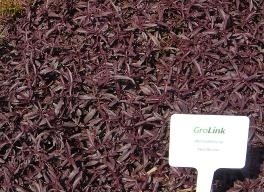 Iridescent, purple leaves with silver veinings make this an absolute must for your partially shaded garden, and it can handle sun with adequate moisture too. If you already have a bed filled with perennial ferns, hostas, and other shade lovers, this is a wonderful filler and adds a silvery, almost metallic sheen. 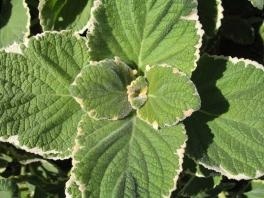 Plectranthus/Swedish Ivy – beautiful variegated or silver foliage. 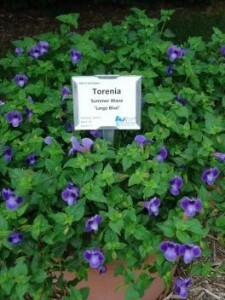 Torenia – With it’s blue, white or pink blooms, torenia, or wishbone flower comes in a trailing variety or as a short, upright plant and will do best in partial shade, not heavy shade. Salvia farinacea/mealycup sage – With it’s blue flower spkes, this salvia prefers a touch of shade in our southern heat, so it’s a very good alternative in beds that get some morning sun but shade in the afternoon – and it will need less water than your impatiens ever did! Alternanthera Joseph’s Coat – Another foliage alternative – very pretty with the big leaves of caladiums…. We hope a solution is found to combat this disease. Until then, being informed is the best defense – and we want you to have the latest and most complete and accurate information. This entry was posted in Annuals and tagged downy mildew, impatiens alternatives on March 25, 2013 by Kris Blevons.